Although one of the NWOBHM’s lesser-known bands with just two compilation tracks to their name, Alien were certainly not without their fans. In his NWOBHM Encyclopedia Malc Macmillan is effusive with his praise, referring to them as the “criminally ignored Alien, whose ‘Absolute Zero’ effort is of the same standard of genius as their contribution (‘Could Have Done Better’) to the ‘One Take No Dubs’ EP, so it’s a complete mystery how this mob failed to land a deal, either with Neat or anyone else.” With a new track from Alien’s 1982 Impulse Studios demo appearing on iTunes, bassist Peter Whiskard was happy to relate what he could remember of those heady days of the early Eighties. “Alien was formed in the North East of England in the early 1980s in a small town called Felling,” he begins. “The original members started in a band called The Flakes with Derek Storey (vocals), Ken McKie (drums), Phil Armstrong (guitar) and Terry Flynn (bass). When Phil left he was replaced by Ron Anderson, and this line-up then became Alien. Terry was replaced by Jimmy Giro from local cult band Punishment of Luxury; when they recorded an album and reformed to go on tour, Alien put an ad in the local paper in early 1982 for a new bass guitarist, which I answered. They were looking for someone with a heavier style than Jimmy, who was in their words ‘too funky’! I’d previously been in a band called Bad Luck who’d recorded at Impulse Studios. Peter recalls that at one stage CBS Records appeared interested, but nothing came of it. “A lifeline” in his words, came in the form of Neat Records’ famed £50 demo package, in which for a flat fee bands could record a live-in-the-studio demo at Neat’s Impulse Studios. “I don't recall how exactly we were approached,” Peter recalls, but he thinks that there was an “understanding that a track would be issued on the ‘One Take No Dubs’ compilation as well as a cassette exclusively sold through the Sounds and Kerrang! music newspapers. 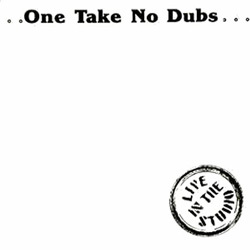 ‘Could Have Done Better’ appeared on the ‘One Take No Dubs EP’ in February 1983. 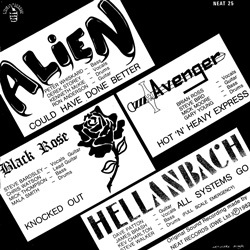 Meanwhile, another track from the session, ‘Absolute Zero’, had been included on Neat’s ‘60 Minutes Plus Heavy Metal Compilation’ cassette, which later appeared in Europe on vinyl in shortened form (although still including Alien’s contribution) under the title ‘All Hell Let Loose’. However, as Peter recalls, “even this relative promise of success was complicated with problems as the singer was convinced that David Wood was attempting to exploit the band financially and this led to a falling out. We did proceed in stops and starts through 1983, at one stage ‘reforming’ for a charity gig for a friend who’d lost both legs in a motorbike accident, but eventually the band completely fragmented by the autumn of ’83 which was a great shame as even now I consider that Alien had the most promise of any band I have ever been in. “Two more tracks from that session were unreleased at the time: ‘Who Needs The Army’ and ‘Yesterday’s Confusion’. As we had already agreed to use ‘Absolute Zero’ and ‘Could Have Done Better’ these others were a bit rushed in the studio, but I still contend that ‘Who Needs The Army’ is still regarded as our tour de force as it was literally done in ‘one take’ and featured some amazing improvisation in the middle section that displayed Ron’s guitar virtuosity like nothing else. “Unfortunately Ron recently died. Someone who seemed to know him told me it was the inevitable consequences of the alcoholism that was beginning to be evident even when I knew him in 1982. I tracked down a YouTube clip of him playing, and although the sound is quite poor it still shows what a talent he was.